Is proud to present the BMW F3x and F8x series headlight switch trim in real carbon fiber. Please allow up to 2 weeks for production. We Have taken the ordinary and transformed it into something extraordinary. Either as a supplement piece to your existing carbon fiber or as your first piece, you will be proud to show off this carbon fiber to your friends and post pictures for all your buddies to see! BMW Headlight switch trim isn't boring anymore! We have done it once again. This is the perfect compliment to our full carbon fiber interior trim for your BMW 3 Series, 4 Series, M3 or M4. This is also a great first piece of carbon fiber for your BMW. This is NOT a sticker or overlay, this is an original BMW OEM part re-manufactured with real carbon fiber! Now have the ultimate interior for your ultimate driving machine! 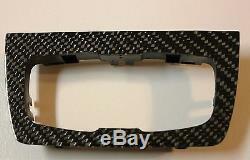 BMW headlight switch trim in real carbon fiber! About carbon Fiber--All Carbon Fiber is not created equally! We use 2x2 Twill 6k 11oz carbon fiber. This material is a high grade PAN Fiber, which means you are receiving a higher quality material than most other fabrics on the market. When first starting out, we didn't use this material either. It is that much better! Ask your carbon fiber professional about what carbon fiber they use. Demand the best for your car! Ever wonder why competitors pictures are out of focus? They don't compare to our quality, so why would they want to highlight flaws in their pictures. Don't be fooled by cheap prices... Sellers: Add a FREE map to your listings.